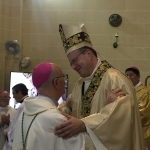 On Friday 4th September the Marian Sanctuary of Our Lady of Ta’ Pinu in Gozo, Malta, witnessed to the Episcopal Ordination of the new Coadjutor Bishop of the Apostolic Vicariate of Tripoli. 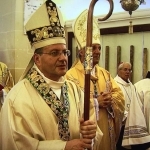 Bishop George was consecrated by Bishop Mario Grech of Gozo together with Archbishop Savio Hon SDB, Secreatary of the Congregation of the Evangelization of Peoples and Bishop Joe Bonello OFM of Juticalpa, Honduras. 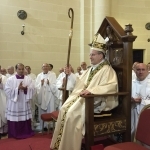 Present also were Bishops Sylvester Magro OFM of Benghasi, Libya, Robert Camilleri OFM of Comayagua, Honduras, Charles J. Scicluna Archbishop of Malta, Vincent Landel, Archbishop of Rabat, Morocco, Paul Cremona OP, Archbishop Emertitus of Malta, and Paul Darmanin OFMCap and Joseph Alessandro OFMCap of Garissa, Kenya. Fr. Julio Bunader OFM, Vicar General of the Order of the Friars Minor was also present.